Today's Look: is all about the ever growing popularity of the denim cut-out dress. To start the look off, I chose to be a little daring and wear my skin-baring denim dress. I chose this denim dress, as opposed to many others, because it's unique with its three cut-outs in the front, two in the back, and metal detailing. Since the dress is edgy, I chose to wear my studded, black creepers and black ankle socks. To Pull in the chunky black shoes with a short dress, I wore my black wide brim hat and fringed suede purse. Finishing off the look, I wore two rings, a bracelet, and diamond skull earrings. Outfit Details: Dress by Mustard Seed at urbanog.com, Shoes by Wild Diva at urbanog.com, Purse by American Eagle at ae.com, Hat by Hengshu at oasap.com, Earrings by Wet Seal at Blink (Anaheim, California), Stone Ring at Disney Vault 28 (Anaheim, California), Bracelet was a gift. Fashion Tip: Denim dresses are a hit this summer, as well as cut-out dresses. A denim dress with cut-outs is golden. 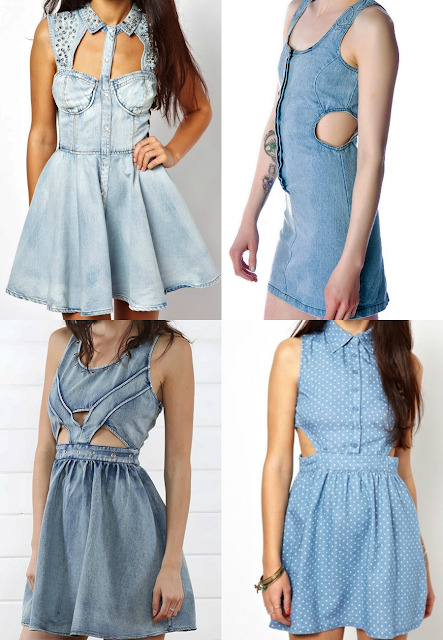 I included some denim cut-out dress options below with their links.